Ice B'Gone Magic is a powerful long lasting deicing treatment. It can be applied directly to pavement, or used to enhance brine or rock salt. Salt treated with Ice B'Gone Magic continues to melt ice and snow down to -35° F. It can reduce the required volume of applied salt by 35% to 50%. 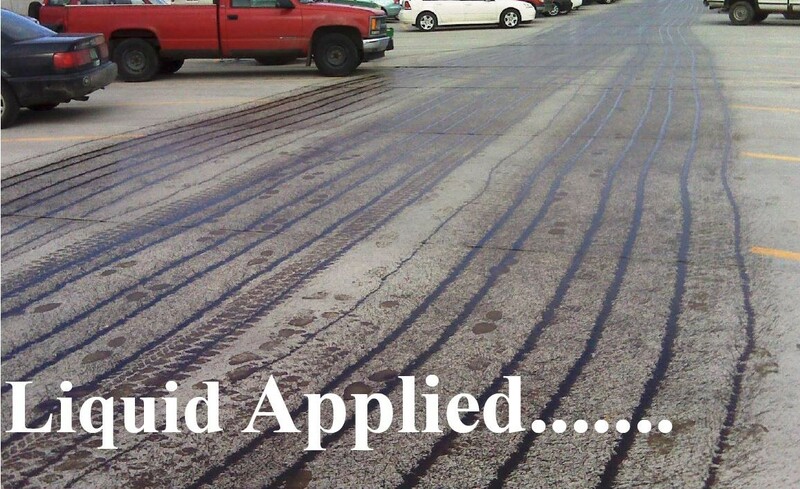 In many cases pretreating surfaces with Ice B'Gone can eliminate the need for additional cleanup or deicing later. Pretreating with Ice B'Gone Magic prevents black ice and hard pack from forming. 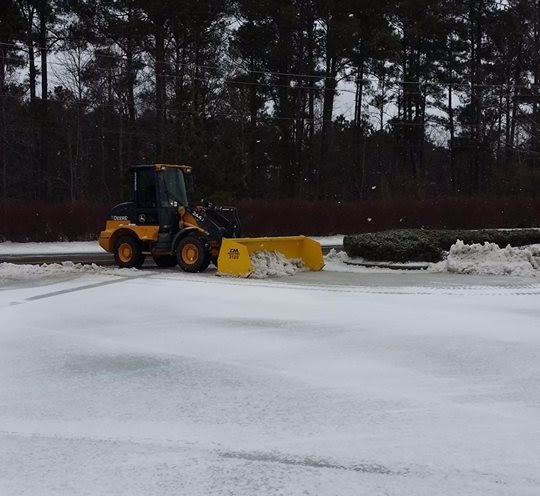 We can apply Ice B'Gone Magic ahead of time to prepare your surfaces for a coming storm, improving traction for vehicles when precipitation first starts. If you're planning to prevent ice with salt or brine we offer anti-icing pre-treatment services. Let us pretreat to get your melt going before the ice and snow become a problem. Pretreating ahead of the storm can be effective at preventing ice and hard packed snow from forming. After pretreating, Ice B'Gone Magic can "burn" through ice and snow during the storm so de-icing or snow removal later can be reduced or even unnecessary. This is a picture of a mall that we treated last year. We treated the ring road which you can see in the background (black asphalt) but not the parking lot (the parking lot was treated with normal road salt). You can clearly see the difference. 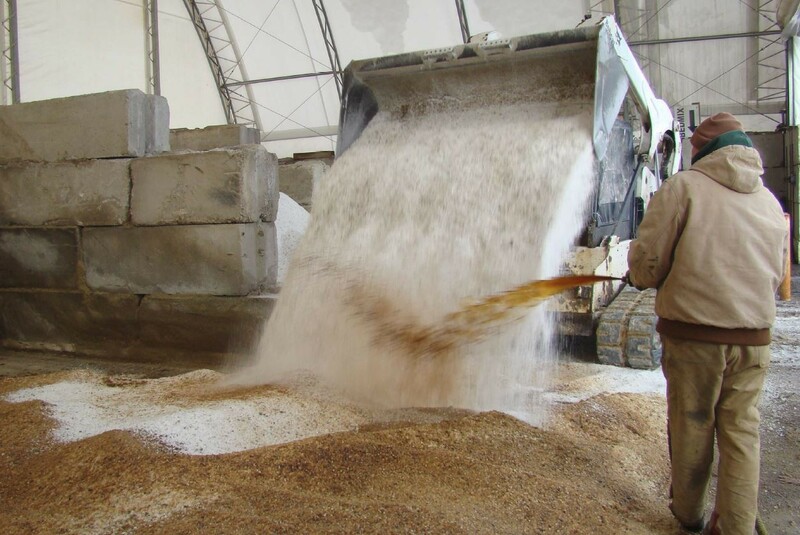 We can supply your needs, from spraying a 10,000 ton salt stockpile down to providing 20lb or 50lb bags of Ice B'Gone Granular. For contractors, municipalities, and property managers salt can be one of the biggest expenses. Salt sprayed with Ice B'Gone Magic can be more effective even when less material is used. This can reduce the raw salt required to achieve melt, which can also save on application time, reduce the number of required applications, reduce vehicle wear and tear and fuel consumption, and yield faster results. 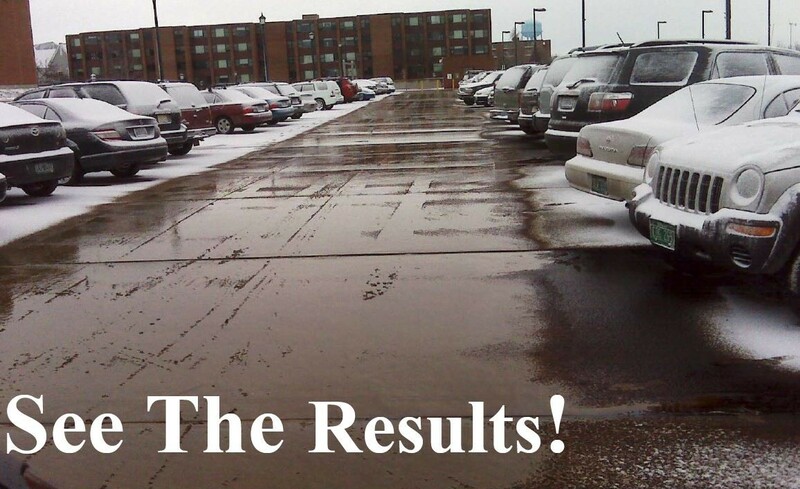 90% less corrosive than traditional salt, Ice B'Gone Magic is safer for all surfaces, including brick and concrete. It is significantly less damaging to grassy areas adjacent to treated surfaces, saving on landscaping repair costs. It is safe for pets and 100% biodegradable. 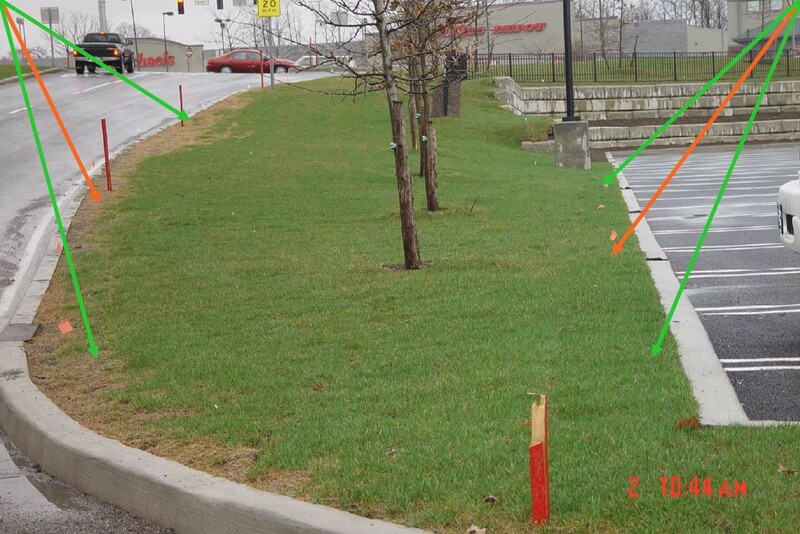 In this image, the arrows on the left point to turf damage caused by traditional salt, while the arrows on the right point to undamaged grass around a parking lot where ice and snow was managed with Ice B'Gone Magic.